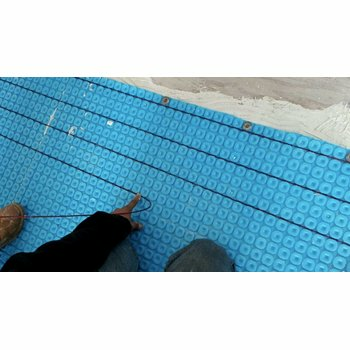 When many homeowners begin their search for an in-floor heating system, they may be surprised to learn that they can purchase the product and install it themselves. No contractor is necessary (although they might choose to hire one based on their level of expertise). 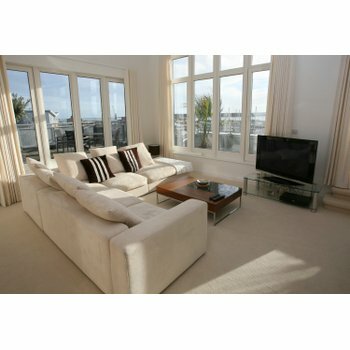 But, the fact is, anyone can install a floor heating system with some detailed directions from the manufacturer. Whether a DIYer or experienced contractor is installing the system, there are a few rules to live by to make sure the project is completed safely and correctly. Rule #1: Never cut the heating wire. WarmlyYours Flex Rolls and Easy Mats feature a heating cable that’s embedded in another material, such as plastic mesh or ultra-thin foil. 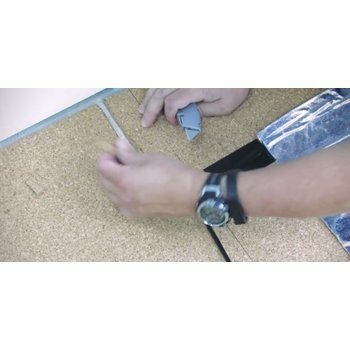 This material holds the cable in a serpentine pattern, keeping the spacing of the cable consistent and reducing the labor of laying out the heating cable. When the Flex Rolls are being installed, they must be cut and turned to heat the entire room. This is when it’s particularly important to be careful not to cut the heating wire. The mesh or foil of the rolls is meant to be cut, but the heating element should never be cut or nicked. Throughout the installation process, it’s vital to ensure that the heating cable stays intact — both for the safety of the installer and the success of the project. Rule #2: Get a custom installation plan. 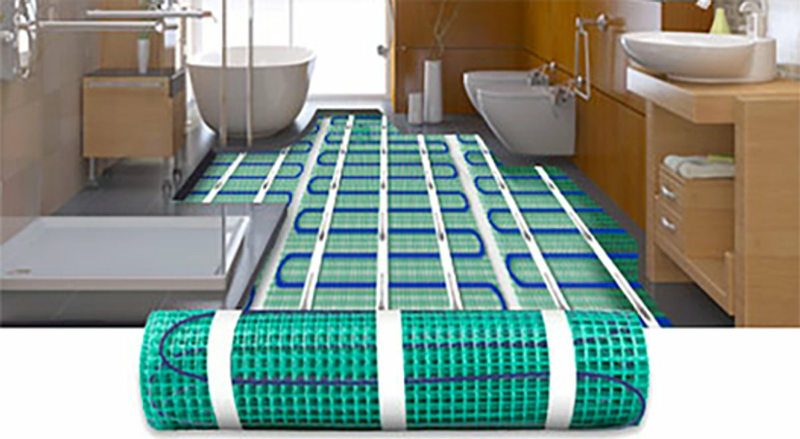 WarmlyYours Radiant Heating offers free installation plans for every project. All the homeowner has to do is provide a floor plan of the room, detail where permanent fixtures and air vents are located, and note where they’d like the thermostat to be located and WarmlyYours will provide a detailed installation plan free of charge. The installation plan shows what products are needed and the best way to configure them to get the maximum heat coverage for the room. A custom installation plan can be requested from a WarmlyYours sales representative online (https://www.warmlyyours.com/contact/quote-request-simple) or by phone at 800-875-5285. Along with your installation manual, this is the most important document you’ll need to step you through your floor-heating installation. Rule #3: Never heat under permanent fixtures or over air vents. Radiant floor heating systems were not designed to go under permanent fixtures or over air vents. It’s important to avoid these areas to ensure that your floor-heating system doesn’t overheat. Permanent fixtures include things like cabinetry, toilets, showers, tubs, etc. Floating vanities, however, offer enough space between the floor and the vanity to make it safe. In general, there should be enough “room to breathe” between your floor-heating system and any fixtures above. If there’s any concern that your project doesn’t follow this rule, you can double check with a WarmlyYours expert at 800-875-5285. Rule #4: Test the system with a digital ohmmeter and Circuit Check. Before, during and after installation, you should test the floor-heating system with a digital ohmmeter. This tool ensures that the system is in good working order and stays within the allowable ohms resistance range specified on the product. Similarly, attaching a Circuit Check to the system throughout the installation will alert you if any damage is done to the heating element. For instance, if the wire gets nicked, cut or even bent too tightly, a siren will go off on the Circuit Check, alerting you to stop your work and make sure no damage has been done. Rule #5: Call technical support. WarmlyYours Radiant Heating provides free technical support 24/7. If you ever have a question before, during or after installation, don’t hesitate to call WarmlyYours at 800-875-5285. Our team members have spent years troubleshooting floor-heating system issues, so they’ve likely already faced any questions or problems that could come your way. It’s their mission to help guide our customers, so be sure to take advantage of this unique benefit if you need to. By following these five golden rules, you’ll be armed with the most important knowledge when you’re ready to start your floor-heating project. Know of any other “golden rules” that should make this list? Let us know on Facebook or Twitter!